Satire is largely unusual in ecological science or science in general. One could argue that satire is antithetic to science. Science is a systematic enterprise that builds and organizes knowledge in the form of testable explanations and predictions about the world, while satire is a literary style presenting the world in a deliberately aggressive and mocking angle with the intention to provoke reflection, stimulate critical thinking, and trigger societal change. However, science and satire originally stem from a common root, as satire was practiced by ancient Greek and Roman thinkers. One of the first satires is reported to be Aristophanes’ portrayal of Socrates, The Clouds, written in 423 BC. Satire is certainly not intended to be an alternative to traditional scientific communications, which guarantee the needed sobriety to effectively present research results. I believe however that satire can be relevant to put in perspective, for both scientists and the broader public, contemporary issues at the interface between science and policy-making. In 2017, Ripple and colleagues published in Bioscience a warning to alert decision makers, the civil society, and humanity in general to the severe degradation of the state of the world. The approach taken by the authors was to write a short and synthetic paper and invite the scientific community to sign it. The rationale was that if more than 15 364 scientists would raise alarm about an issue, this issue would then receive a particular attention and relevant actions could be implemented. My concern was, however, that their warning would be published but would not be heard. With three other French colleagues, we therefore decided to write a reply where, instead of agreeing with Ripple et al., we stated bluntly that people were not willing to adjust their way of life to save the planet and that Ripple et al.’s warning needed to be categorically rejected. We also invited signatories to symbolically withdraw their signatures by not engaging into issues (such as over-population) that Ripple et al. mentioned. So far, it is not unreasonable to say that our satritic reply seems to have been a quite accurate description of reality and if anything, it was probably not satiric enough. In Ripple et al. , 15 364 scientists from 184 countries issue a ‘warning to humanity’ and present a radical agenda to protect planet Earth. We, the billions of people believing in human exceptionalism, categorically reject this agenda and issue in return a stark warning to planet Earth. No amount of facts showing that planet Earth is in a dire state will have us changing our mindset, thank you very much. We do not care about planet Earth. We care about our next devices and their latest cool features. We want more stuff. The signatories of Ripple et al. ignore the obvious facts that the era when poets could marvel at the diversity of flower or insect species is over, and that real-world wildlife has now become obsolete. We simply take our smartphones to overlay customized virtual creatures on our surrounding environment and dispose of them when new trends dictate. There is no longer a need to preserve filthy and dangerous wildlife that moreover lives in places where Amazon Prime does not deliver. More iPhones are sold in a few days  than there are tigers, elephants, and gorillas on the planet: this should alert the signatories to what really matters, were they not ideologically biased against human progress. Those scientists argue that we are approaching many of the planetary limits. We refuse to accept any type of limits: growth must indefinitely prevail unrestricted. We officially summon planet Earth to abandon its intransigent attitude and accept the inevitable: an extension of its biological and physical limits. Should planet Earth stick with its hardline ideological stance, it needs to be aware that mankind will never com- promise and that we will seek a second planet. The universe is like our ambition: limitless. The new economy of nature, whereby ecosystem services such as pollination are monetarily valued, should not be understood as another dogmatic way of protecting planet Earth. It is instead a call to producers and shareholders to con- quer new markets by outcompeting nature with better services at a cheaper price for consumers. Ecosystems must fight for their survival like any other busi- ness. Protecting nature would moreover give it an undue competitive advantage against our industries. If our agricultural practices endanger the bees that pollinate crops, this does not imply we should change these practices. Instead we will let bees disappear and replace them by AI-powered microdrones – which create many jobs and do not sting. The obvious ideological aim of Ripple et al. is to inspire a generation of scientists to ask broader questions relevant to overconsumption and overpopulation, and how our institutions can meet the challenge of reducing human pressure on planet Earth. We find this unacceptable and call on the 15 364 signatories to join us on the side of winners against planet Earth, and hence to symbolically withdraw their signatures by not engaging in any of the research suggested in the warning to humanity. Fellow scientists, ask not what more you can do for planet Earth, ask what more planet Earth can do for you. And note how politicians on both the left and right are already united in this truly bipartisan issue that beautifully tran- scends the political divide: worshipping growth and denying that we depend on our environment. We therefore strongly oppose the agenda accompanying the warning to humanity and will not tolerate any obstacle to our way of life – be it tree-huggers or the trees themselves. At the first Earth Summit in Rio de Janeiro in 1992, the 41st US President claimed ‘our way of life is not up for negotiation’. Today, speaking in the name of billions of people, we proudly claim to all be US presidents. Planet Earth: consider yourself warned. Apple Inc (2017) Apple Reports Fourth Quarter Results - Data Summary. Original publication: Chapron, G., Levrel, H., Meinard, Y. & Courchamp, F. (2018). A Final Warning to Planet Earth. Trends in Ecology and Evolution 33(9): 651-652. This paper which came out of a frustration in front of the increasingly degraded state of the planet and which broke standards of scientific communication attracted more attention than expected. We wrote a follow-up paper explaining the role satire in 21st century conservation, also published in Trends in Ecology and Evolution. The Atlantic magazine later published an online piece about our papers and discussed the role of satire, explaining that studies have shown that when it comes to relaying scientific messages, satire can be more effective than sincerity. In a paper published in the Proceedings of the Royal Society B: Biological Sciences Blood does not buy goodwill: Allowing culling increases poaching of a large carnivore, we evaluated the hypothesis that liberalizing culling will reduce poaching and improve population status of an endangered carnivore. We found that allowing wolf culling was substantially more likely to increase poaching than reduce it. Our results suggested that granting management flexibility for endangered species to address illegal behaviour may instead promote such behaviour. 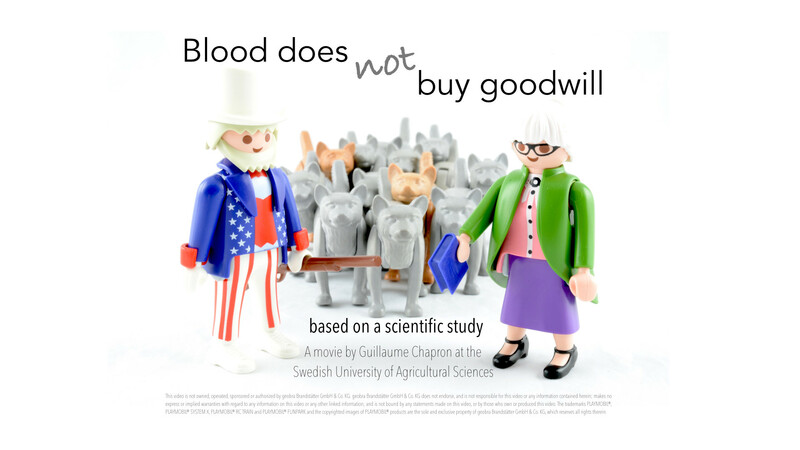 Because I anticipated the findings to be controversial, I took the opportunity to experiment an alternative way of communicating science to the public by producing a gently satiric video with Playmobil figurines. The video consists of 1500 pictures taken in a white tent and assembled together in a 3 min-long movie and took one full week to produce. Our paper has indeed proven controversial and interested readers should also read the three replies we received by Pepin et al., Olson et al. and Stien, which we rebutted in a first and second reply. It is unclear how this video contributed to public and researcher attention (it was however featured on the BBC and Washington Post) but if it did contribute to generate more coverage, including criticism such as the replies we received, this was worth the effort.